After nearly two years in development, the first TS-2 (double pickup model) from Bourbon Barrel Guitar Company is out on the road being tested! 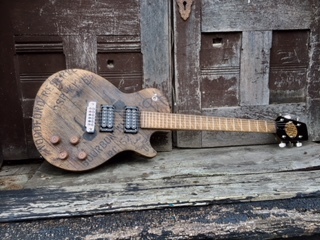 This guitar was built from a Woodford Reserve head and has an old soul….literally. The pickups are from a mid 1990’s Explorer. It has been described as having a tone that is very warm and tasty…like that of a very old bourbon that has aged well into its prime!